Although iris flowers have all the same basic components as other flowers, they have some special features as well. Irises are extremely well-equipped to both attract pollinating insects and help the insects to transfer the pollen into their ovaries. 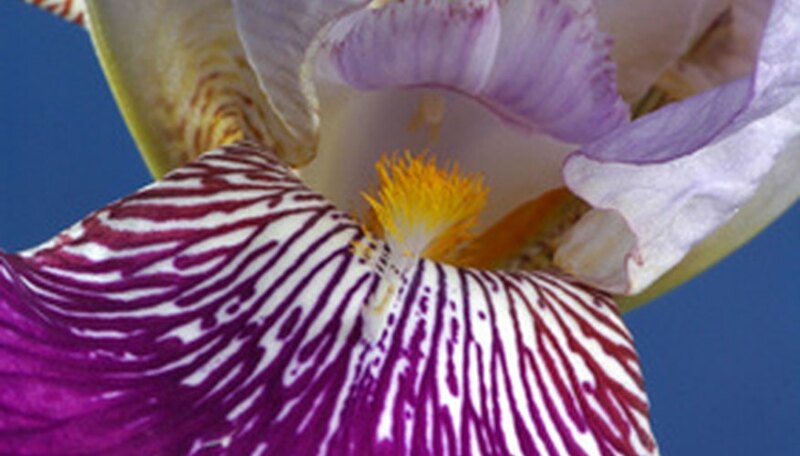 Flower parts in the iris are not simply designed to make the blossoms beautiful, but are made with insects in mind. Part of the perianth, the petal-like falls attract pollinating insects to the center of the flower with a bright-colored middle line in each of the falls. The falls also flatten out and bend downward to act as a landing site for the insects. In most irises, the falls are lighter in color than the rest of the petal, usually a shocking white or yellow. Each iris flower has three standards, or erect inner petals. Like the falls, the standards also attract pollinating insects to the flower’s nectar. Unlike the outer petals with the falls, however, the standards are usually solid in color, without the central strip of lighter coloring. The style arms of the iris flower are part of the pistil, or female reproductive organ. Irises’ style arms are located in the center of the blossom and resemble petals, unlike other flowers that have a distinct style connecting the ovary to the stigmas. 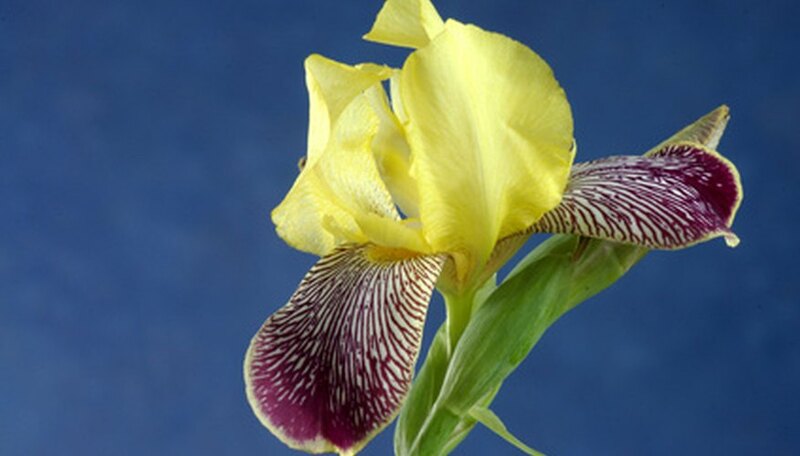 The stigmatic lip acts as the stigma in the iris flower. The stigmatic lip helps to rub the pollen from the insect’s body into the pollen tube that carries the male reproductive pollen grains down to the ovary. The stigmatic lip is located at the top of the style arm. Beneath the arched style arm is the stamen, which contains the male reproductive pollen grains. 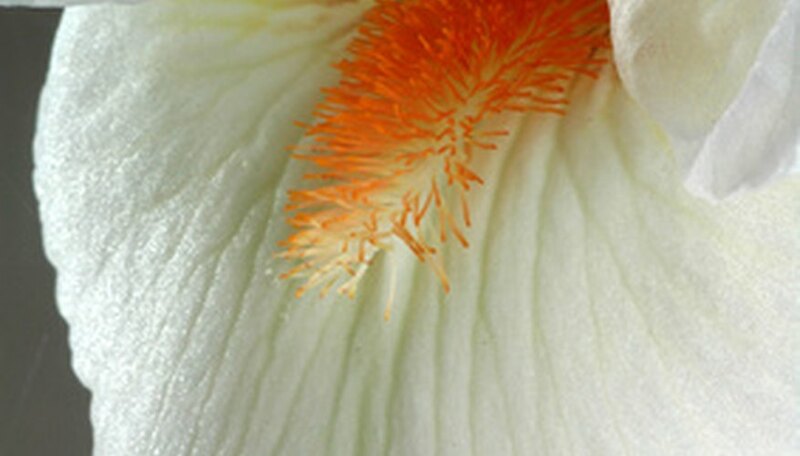 In the iris flower, the stamen grows in the center of the bloom, right beside the style arm. Because the stamen grows so close to the style arm, pollen grains easily transfer to the female reproductive organs. Many species of iris flowers have beards. The beard is a fuzzy structure that grows on the top surface of the falls. The beard serves as a perching apparatus that offers pollinating insects a grip to hold onto when they’re entering the iris flower to look for nectar.